With its atypical design, the Sardi Border Checkpoint certainly draws attention of tourists and will become a major local landmark. Situated at the Georgian border to Turkey, at the shore of the Black Sea, the new customs checkpoint was completed this month, November 2011, after only one year. 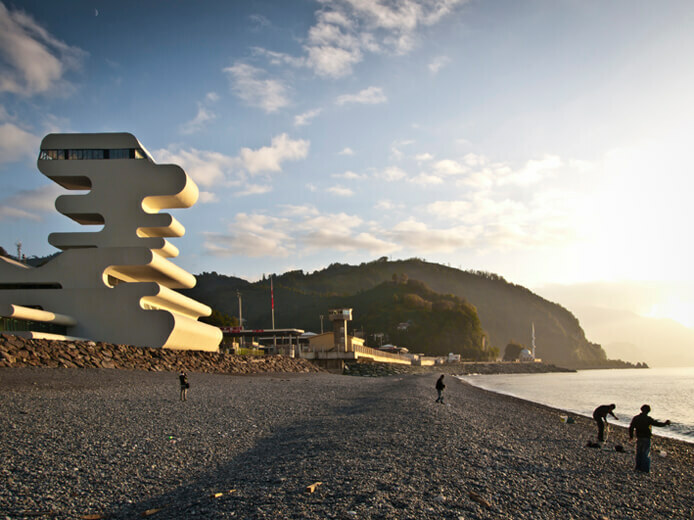 Designed by J. MAYER H. Architects, this dynamic seaside building features a contemporary and distinctively design with cantilevering terraces and a myriad of overlapping levels that overlook the water. Besides the regular customs facilities, the curved two-storey monument also houses a cafeteria, staff rooms and a conference room. Photos: © Jesko Malkolm Johnsson-Zahn, Beka Pkhakadze.